The best handheld shower head can take your shower experience from frustrating to exhilarating simply by providing good pressure and a soothing spray, but there is much more to consider. The latest generation of handheld shower heads offer features such as pausing the flow of water, tangle-free and stretchable hoses, water conservation without sacrificing pressure, and easy-clean nozzles that don’t allow lime scale or soap scum to stick to the surface. These shower heads have features such as dual heads, multiple spray settings, built-in leak prevention, choice of finishes and tool-free installation. If you’re looking for a shower head that will solve your low water pressure issues, there are several that fit the bill. These shower heads have innovative designs that build up pressure within the hose and the head so that you get a nice strong spray even if the pressure in your home is poor. With thousands of options available, we’ve narrowed it do to some of the best handheld shower heads available in a variety of price points. 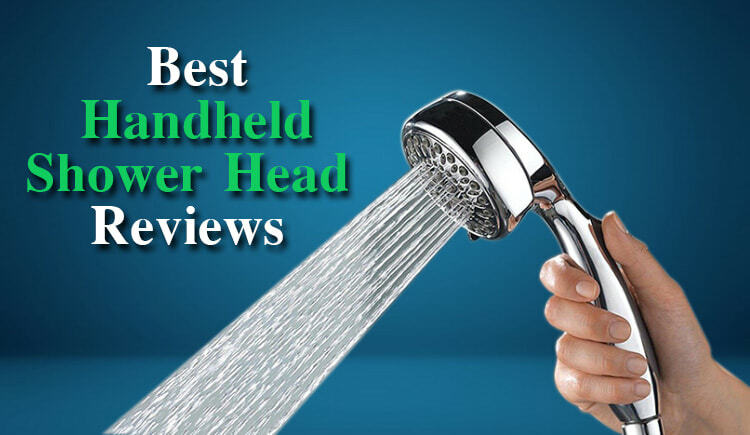 This home appliance guide lists of the top 10 handheld shower heads described details below. The Ana Bath anti-clog 5-function handheld shower system has dual high-pressure heads that really do offer a high-pressure spray, even when both are in use. The system allows you to use one head or the other, or both at the same time. Both shower heads have an anti-clog system that allows you to easily remove any lime or calcium buildup from the surface simply by clicking and turning the face of the head. The extra height created by the way the hand-held head is mounted can be either a pro or a con, depending on how tall you are. For taller individuals, the extra height makes showering comfortable and eliminates the need to contort yourself to get your head under the sprayer. For short individuals, however, the extra sprayer can be difficult to reach to take in and out of the mount. The system has brass connectors and a stainless steel hose for durability, but all of the parts are electroplated with a matching brushed nickel finish for lasting beauty. The system does not require a plumber for installation. The Delta 7-spray Touch Clean shower head has two innovative features to win you over. The first is the Delta Touch clean system in which the shower head holes are made of a special rubber that allows you to wipe away any build-up or residue with nothing more than a soft cloth. No harsh cleaners and no soaking is necessary to clean the shower head. The second innovative feature is the pause setting. This allows you to temporarily reduce the flow of water to a small trickle for tasks such as shaving, and then resume the regular flow at the same temperature where you initially set it. This is also useful for conserving water, allowing you to quickly reduce the flow while lathering or shampooing and resume it again without wasting time and water re-adjusting the temperature. The head has six other settings in addition to the pause setting to allow you to find just the right speed and pressure. The hose is six feet long and includes an internal hose and vacuum breaker system to help protect against breakage and leaks. 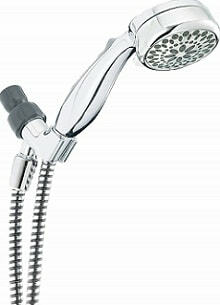 Delta offers a long time warranty on the 7-spray handheld shower head. The Hydroluxe Ultra-Luxury 3-way shower combo features a total of 24 different water flow combinations and two shower heads. Each shower head can be controlled separately and both have the popular pause feature which allows you to reduce water flow to a trickle and then turn it back on at the same temperature where it was previously set. The wide range of settings gives this shower combo its luxury title. The different settings can be combined to create a custom, spa-like experience. 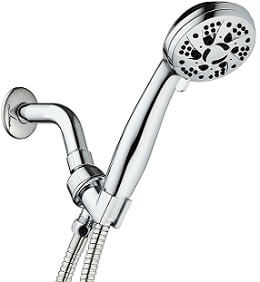 A five-foot-long stainless steel hose and brass connectors give the shower head set durability, while the chrome finish makes it look good. The set is designed to be installed without any tools or special knowledge, making it a perfect do-it-yourself project. Both shower heads feature easy clean jets that can be kept free from the residue by wiping with a soft cloth. The only downside to this shower headset is that the settings can be complicated to change while the shower is running since it is hard to get a grip on them when they’re wet. 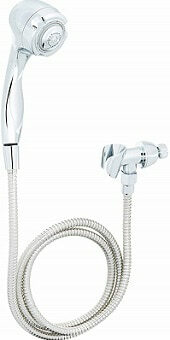 The Yoo.Mee high-pressure handheld shower head is designed to create additional pressure when water pressure is low. It doesn’t require any special tools or changes to your existing plumbing to provide additional water pressure. In fact, everything necessary for installation is included with the shower head. The hose is longer than many others at approximately 6 1/2 feet, giving you the extra length needed for larger showers, bathtubs or for other tasks such as bathing pets. It is made from stainless steel, and the kit includes brass connectors to prevent cracking and breaking. The large surface shower head has high-grade silicone rubber nozzles that are easy to clean. A water regulator is included with the shower head that allows you to reduce the pressure if you desire, either to reduce water use or for a gentler showering experience. The shower head has three different spray settings, including a pulsating massage setting. What the Yoo.Mee shower head lacks in a choice of spray settings it makes up for with a powerful water flow. It comes with a 100-percent guarantee that your water pressure will be increased from the shower head. The Niagara Conservation handheld shower head is designed specifically to conserve water without sacrificing water pressure. At a flow rate of two gallons per minute, the system uses an internal pressure compensator to make the low pressure feel like high pressure. The shower head has nine different settings, including both forceful and gentle options to suit all preferences. The extra-long hose gives the user plenty of options as well. Coming in at 72 inches, or six feet long, you won’t have to worry about being able to reach the entire shower or bathtub. In addition to conserving water, the shower head is designed to prevent the flow from aerating so that it maintains its temperature better. This makes the shower feel hotter without using extra energy. 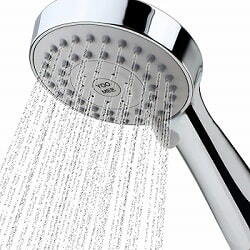 The jets are self-cleaning, so you will never have to scrub the shower head to remove hard water buildup. The Niagara Conservation shower head strikes a good balance between conserving water and energy and delivering a hot, forceful shower. It can also help reduce utility bills by reducing water and energy use. The ShowerMaxx Luxury Spa shower head has an eye-catching brass finish. It has nine different spray settings, including a trickle mode to save water while lathering or shaving. The hose has a unique stretch feature. While not in use it is just under five feet long, but it stretches to a full 6 1/2 feet. This helps keep the hose out of the way when not needed but still gives you the option of extra length, making it ideal for use with small children. An optional flow restrictor is included with the ShowerMaxx so that you can decide whether you want to use it to conserve water or leave it out to obtain the maximum amount of pressure possible. Another desirable feature of the ShowerMaxx is the adjustable brass ball joint that makes it easy to adjust the shower head to any desired position. 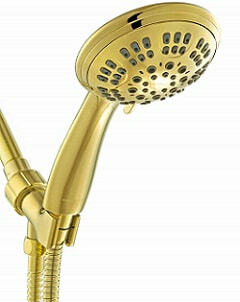 While the entire shower head is made of ABS, it has a durable polished brass finish. The shower head is simple to install and comes with the necessary plumber’s tape, rubber washers, and complete instructions. The jets are easy to clean with just a soft cloth. It comes with a long time warranty so you don’t have to worry about the expense of replacing the unit if something does go wrong. The Aquasense 3-setting handheld shower sprayer is a value-priced option that still offers some desirable features. The hose is a lengthy 6 1/2 feet so you can easily reach everywhere, whether in a standing or sitting position. The long hose is also useful for bathing small children as well as pets. While there are only three basic spray settings, including narrow, standard, and wide, a control knob lets you adjust the flow rate to your liking. The combination of the long hose and the ability to instantly control the flow rate directly from the handheld shower head makes the Aquasense a good choice for people with disabilities or who need to sit during a shower. The included hook also allows you to place the shower head at a lower position than most standard shower heads, making it easy to access without reaching overhead. The stainless steel hose is built to be tangle-free and durable. The shower head is made of corrosion-resistant white plastic that blends into any decor. No tools are required for installation. The Aquadance High-Pressure handheld shower provides a forceful stream even in homes with low water pressure. It may be the best handheld shower head for low water pressure. It has six different spray settings that are easy to adjust, even during a shower, thanks to the click-lever dial. The system features an ergonomic handle so your hand won’t tire during use. This can be especially helpful if you use the shower head to bathe children or pets. The mounting bracket is adjustable, so when the shower head is mounted it can be moved to the most comfortable position. Like many of the best handheld shower heads, the Aquadance has a pause feature that allows you to reduce water flow to just a small trickle and then turn the flow back on at the same temperature when you are ready. This feature saves time, water and energy. The stainless steel hose is five feet long and is designed to be super flexible so that you won’t be battling with the hose to bathe or to keep it against the wall and out of the way when not in use. The Aquadance also has several optional upgrades, including a double head and a large six-inch rainfall shower head. 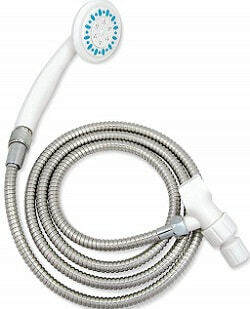 The Zenfresh Ionic Filtration shower head is designed to fight against dry skin and hair. 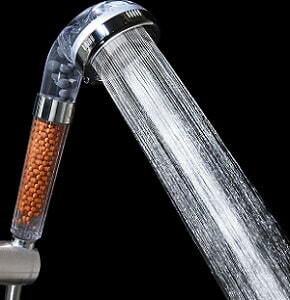 The shower head uses three different layers of bioactive stones to filter the water before it leaves the shower head. The result is ionized water that doesn’t dry your skin and hair, creating a spa-like experience in your own home. Ionized water also benefits your skin by balancing oil secretions and breaking the unhealthy skin dehydrating cycle often created by standard hot showers. In addition to filtering the water, the Zenfresh uses laser-cut cone-shaped holes to deliver high water pressure regardless of the pressure at the source. It does not offer multiple settings or massage options. The combination of chrome and clear plastic gives the shower head a sleek modern look. The three different types of filtering stones are visible through the clear portion of the handle. The shower head is simple to install and can be put in place by anyone with basic do-it-yourself skills. The Vida Alegria shower head has many of the best features of luxury shower heads and is also available in several different finishes to match the rest of your bathroom fixtures. Optional finishes include chrome, brushed nickel, and oil-rubbed bronze. The shower head features the popular pause option, so you can quickly turn the water down to a trickle for shaving and shampooing and then turn it right back on at the previously selected temperature. Four other spray options include a true rotating massage spray. It also features a stay-clean ABS face that is easily wiped clean without the use of cleaners or descaling chemicals. The hose is stretchable, starting out at five feet and stretching all the way out to seven feet. It is also designed to be tangle-free. In addition to being easy to install, the mount features stay-put technology that prevents it from moving or flopping around while you shower. Once you position it where you want it, it stays in place. The Vida Legria comes with plumbers tape and detailed installation instructions. If you have low water pressure, look at models that are specifically designed to increase pressure. The difference between a frustrating shower experience and an enjoyable one often comes down to water pressure. Besides, all the massage and spray options in the world are useless if the shower head doesn’t produce enough pressure to enjoy them. Do you shower alone or with someone? Are multiple spray settings important? Does a pause feature sound like a great idea or a useless addition? Ask yourself how you will install a handheld shower head and what features are most important to you. For example, if you’re sick of untangling the hose on your current handheld shower head, a model with a tangle-free cord might be the perfect one for you. If you plan to use the shower head for other purposes, such as cleaning the bathtub, bathing pets or even to rinse shampoo out your child’s hair, pay attention to the length of the hose and the number of spray settings. You will want strong settings for cleaning and gentle settings for pets or children. You want your new investment to last, so look for models that have brass connectors and stainless steel hoses. 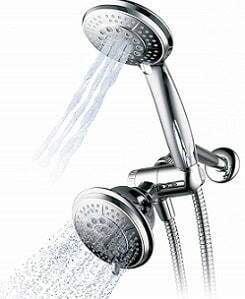 High-end shower heads will also have internal components designed to stop leaks. 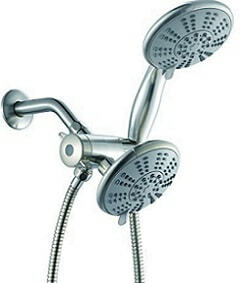 Many companies also offer long-term or even lifetime warranties on well-built shower heads. Is appearance more important than function or do you want a shower head that fits in with your decor? While a bright chrome finish is a perennial favorite, you may prefer the look of brushed nickel, oil-rubbed bronze, or even polished brass. Unless you plan on hiring a plumber to install your new shower head, look for units that don’t require any special tools and come with complete detailed instructions. Your new shower head won’t do you any good if it’s sitting in a box somewhere because it was too difficult to install. 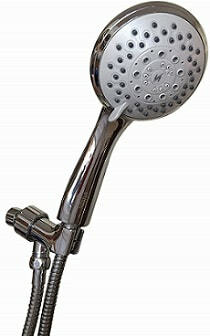 The best handheld shower head is one that meets all of your personal needs and is a pleasure for you to use. Several on this list, including the Vida Alegria, the Yoo.Me, and the ShowerMaxx get high marks for improving water pressure, offering satisfying sprayer options and being good-looking as well as durable. Other contenders for the top spots include the Delta-7, Aquadance and Niagra Conservation. If you’re on a tight budget or have limited mobility, the Aquasense is another great choice. With so many great handheld shower heads available in every price range it’s time to give up your old low-flow shower head and get one that leaves you feeling great.